Val Verde School District prepares today's students with tomorrow's skillsets. Educators today carry a heavy burden — they’re expected to teach students for jobs that don’t exist yet. At Val Verde Unified School District in Parris, California, that reality has shaped the mission and technological drive across the district. The district is committed to building future-ready students and has devoted considerable energy brainstorming to develop what the school calls a “Portrait of Graduate.” This paints the picture of a student who possesses the skills to think critically, be creative, communicate and collaborate, and be flexible. With that has come the challenge of updating classrooms and introducing curriculum with advanced systems that will prepare them for a rapidly-changing landscape. The district is made up of about 20,000 students and continues to grow. The once small district credits its growth to the onslaught of new companies opening new distribution centers in the area, including Amazon, O’Reilly Auto Parts, and Walgreens. The district also includes March Air Reserve Base. As a result, the school district also has an increasing responsibility to prepare its students for the skilled workforce that will be needed in the area as job opportunities surge. To address that need and help students realize the full portrait of a graduate characteristics, the district wrote a lengthy and detailed technology-centered Future Ready plan. In addition, the district began building a framework around the philosophy of world-renowned education futurist Dr. Sonny Magana. Magana’s T3 framework presents a hierarchy for improving instructional quality while unleashing student’s potential in the classroom. That framework made Val Verde administrators ask how they could ensure all kids have access to STEM curriculum after seeing an onslaught of STEM magnet schools popping up and the testimonies of success. What that looked like as part of their plan was a space — a lab — within each of the district’s elementary schools where teachers could use coding, engineering, robotics, and more to enable students to move forward as critical thinkers and innovators. “We filled those spaces with Legos, coding opportunities, Ozobots, and all the tactile things, but we needed a technology that integrated it all together,” said Doug Henderson, the district’s STEM coordinator. That’s where HoverCam came in. Val Verde has been a long-time partner of HoverCam, a company that engineers educational solutions that allow teachers to use technology in the classroom in a new way while relieving some of the biggest device challenges that impede them from creating a fluid environment for collaboration, engagement, and ultimately, success. The relationship with the company began in 2010, when the school purchased four HoverCam T3 document cameras on a trial basis. Today, there are more than 860 Solo 8Plus document cameras in classrooms across the district. That partnership once again came into sharp focus as the district looked for a solution that would enable it to create the modern space they envisioned and that weren’t just innovative solutions but also spurred innovation for the kids. That’s a goal that HoverCam understood well and shared with the district. HoverCam helped the district outfit one of the labs with five CenterStage interactive flat panels (IFPs). Acting as gateways for realizing the four C’s — creative thinking, collaboration, communication, and creativity — the high-tech, high-touch-IFPs are designed to allow kids to come together and work. They can touch-interact with the screen simultaneously without interfering with another person’s work or they can use pens to interact with content. It’s the kind of collaboration that the technology team saw as a precursor to building students’ problem-solving muscles. The other piece of the puzzle for the labs was how to get out from behind the classical model of the teacher commanding the room’s technology from their desks or the front of the classroom. The centerpiece to the experience and environment the district envisioned was one that was equally student-driven and allowed the teacher to move around the room and engage with students. That untethered environment was exactly what HoverCam had envisioned as well when it created its Pilot digital teaching stations. Based off feedback from actual educators, the Pilot is the world's first fully integrated wireless digital podium. 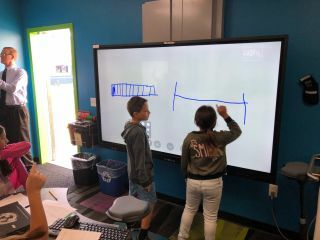 Featuring a Windows PC, 13-megapixel document camera, and 21-inch touchscreen with wireless HD mirroring functionality in a mobile podium, it eliminates the outdated AV cart and combines the most important elements used in today's digital classrooms. It’s built around the concept of unchaining teachers from stationary desks or lecterns, so they can move freely around the classroom while still commanding every part of the technology around them. The Pilot's wireless transceiver instantly beams the podium's screen and touch annotations to the IFPs as well as any projector or TV in the room. in high definition with up to 4K image clarity. And because everything is wireless, it eliminates the hazard of dangling cords and cables as students continue to work. What’s more, the document camera can capture audio from the lesson using a built-in microphone, which enable teachers to easily execute flipped classroom models. The school district also became beta testers for HoverCam’s ClassFusion software, which enables interactive whiteboarding, annotation, and desktop marking for lesson recording and sharing so students can study anywhere, anytime, and on any mobile device or browser. For Val Verde they the software has opened up powerful 1:1 opportunity where there’s interaction between the kids’ devices and what teachers can control. For Val Verde, HoverCam’s integrated, whole learning solutions are perfectly matched for students raised in the digital age. It’s digitally transformed the spaces into something more. Walk into the room on any given school day and visitors will see new things happening every day and even spontaneously as they think about the problems around them. For example, one day the kids were building glider planes. Using the HoverCam CenterStage IFP, they were tracking the success of them getting a ping pong ball across the room attached to the different plane structures they were developing. Over the next two years the school district plans to roll out HoverCam’s education solutions to the middle school and high school. Students and staff alike are excited and impatient for the arrival of the system into their schools.